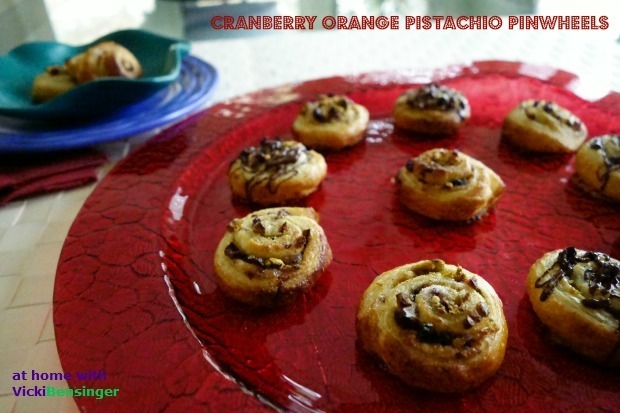 When the people at Pepperidge Farm® asked me if I’d like to create a holiday recipe using their Pepperidge Farm® Puff Pastry Sheets, Shells or Cups, I said, “Absolutely!” I had so many ideas for appetizers, entree’s and desserts I wasn’t sure which way to go. Then I thought about families – coming together in November and December to celebrate the holidays, gathering around the table and snuggling up together in the family room to keep warm by the fire. The holidays are a time to enjoy comforting foods with those you care about. What’s better than something tasty and sweet? Each of my creations produced delicious, fluffy and light pastry treats. 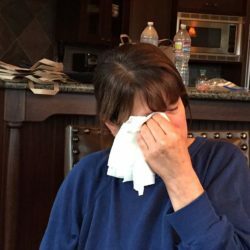 Since it was difficult to select which recipe to post, I decided I’d share and show how I created both the Pinwheels and Wreath. The sticks are easy enough to describe. My family loved them all, but agreed, the addition of chocolate was a must, putting each of these over the top. Of course, if you’re not a fan of chocolate then feel free to omit it, or change up the ingredients to suit your tastes. Afterall, that’s the advantage of being the cook! 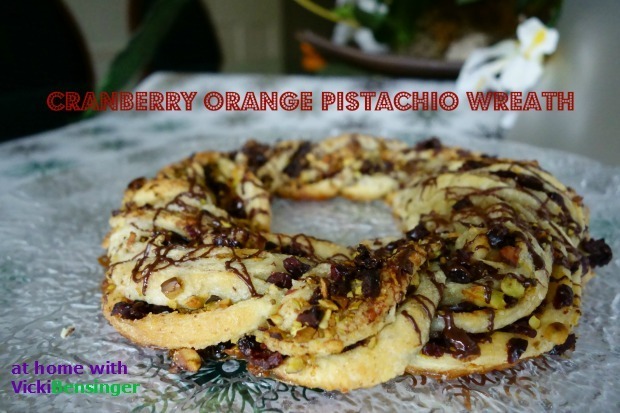 Below are my step-by-step photos of the Cranberry Orange Pistachio Wreath followed by the Cranberry Orange Pistachio Pinwheels – each with a Chocolate Drizzle on top. I hope you’ll try these and when you do – please let me know which variation your family preferred. 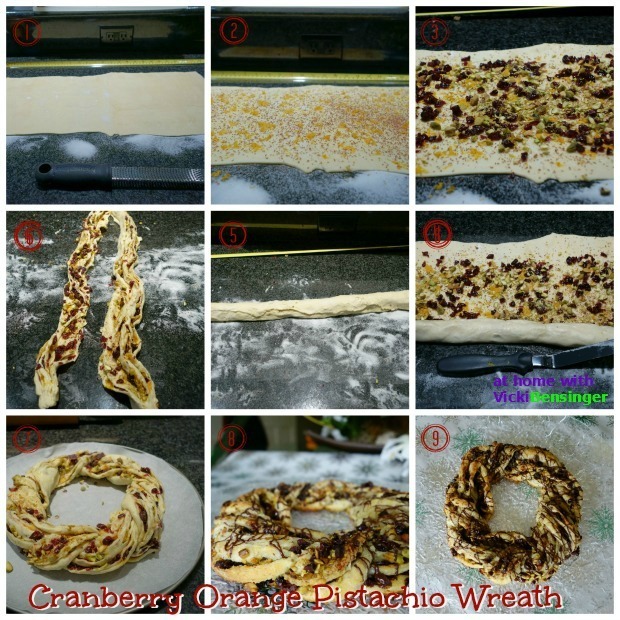 Wreath: Remove (2) both sheets of thawed puff pastry from package (see thawing instructions) Sprinkle a portion of the granulated sugar onto a clean dry surface approximately the size of two sheets of puff pasty. Lay one sheet down lengthwise with the second one slightly overlapping at one short edge. Using the tip of a finger, lightly seal the overlap with water to adhere the two sheets of pastry. Sprinkle additional sugar over the top of the puff pastry. Roll to approximately 9" by 20". Spray top of puff pastry with non-stick spray. Zest both oranges and lightly grate chocolate over entire exposed surface. Sprinkle with cranberries and pistachios, leaving a 1-inch border all the way around. Carefully begin rolling up the puff pastry starting with the long edge closest to you. Slice lengthwise down the center exposing the filling in the middle. Overlap one end of each strip with filling facing upward. 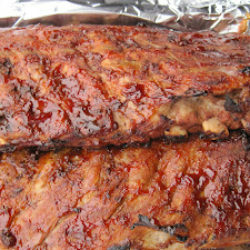 Continue to twist or intertwine the strips together (filling face up) until you reach the end. With filling still facing up, create a circle connecting both ends by overlapping and tucking under. (Work as fast as you can since the puff pastry will become softer). Carefully place (I used a jumbo spatula) on a parchment lined pan - I use a pizza pan, and cover with plastic wrap). 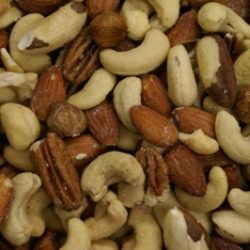 Place in the refrigerator for approximately 15 minutes to chill. Place in a preheated 400F degree oven for approximately 20 minutes or until puff pastry gets golden in color. Allow to cool. Take 1/2 the bar of chocolate, break into pieces and place in a heat proof bowl. Microwave in 30 second intervals stirring in between, until chocolate has liquefied, about 1 1/2 minutes. Using a fork, place into chocolate then wiggle over the top of the pastry leaving a drizzled effect. Remove from parchment and place on a serving tray. Serve. Pinwheel version: Remove one sheet of thawed puff pastry from package (see thawing instructions) Sprinkle a portion of the granulated sugar onto a clean dry surface approximately the size of one sheet of puff pasty. Lay puff pastry sheet down and sprinkle sugar over the top as well. With a rolling pin, roll the puff pastry out to about 1/8" thick. Follow steps 2&3 above (wreath). Starting at the short end, carefully roll up the puff pastry encasing all the ingredients inside. With a piece of dental floss about 12-inches long and holding the string in each hand - slide dental floss under roll, about 1/2-inch in. Then bring dental floss over the top and cross string. Continue crossing string until it has completely sliced through the puff pastry. Place individual roll on a parchment lined baking sheet, and continue slicing, until you have no more rolls to slice. In a small cup, mix egg with a few drops of water, using a pastry brush lightly brush over surface of pinwheels. Place baking sheet into a 400F degree oven for approximately 12-15 minutes or until puff pastry is golden brown. Follow #9 above, then serve. Repeat with second puff pastry sheet if desired or save for another day. Puff Pastry Sticks: Follow step #1 above. Then with a pizza cutter (or knife) cut 1/2-inch strips of puff pastry. Set on parchment lined baking sheet, twisting each piece as you go. Once all strips have been placed on parchment and twisted place into a 400F degree oven for approximately 12 minutes or until golden brown. Allow to cool. 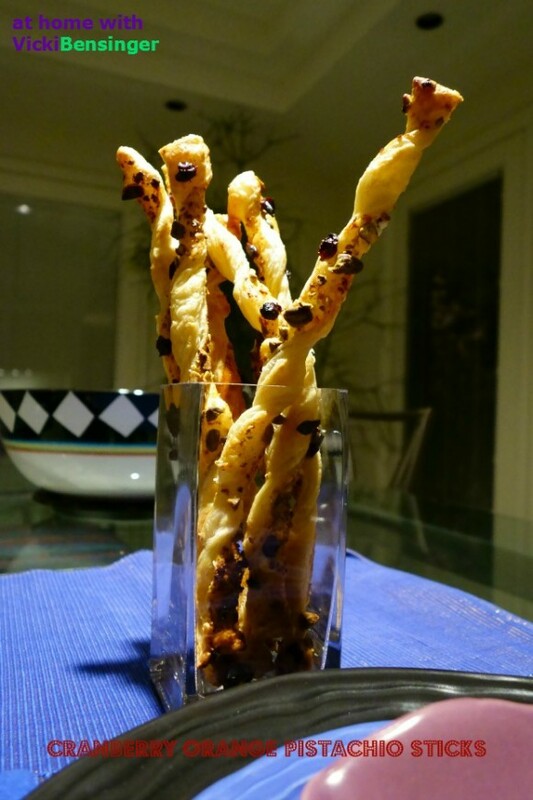 To Serve: Place puff pastry sticks on table in glass jars or vase. 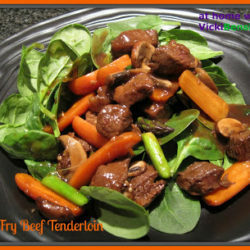 Pepperidge Farm® offers great tips on cooking with puff pastry you will find helpful. For more recipes & tips on working with puff pastry, check out the Pepperidge Farm® website. Don't forget to "like" Pepperidge Farm® on their Facebook page. Thank you Catherine, I hope you’ll try them. Both pinwheels and the wreath are so gorgeous, Vicki. Love the festive filling. Thank you Angie. It was easy and the results were very tasty. I hope you’ll try it. Thanks John. I too always have a box or two in the freezer. You never know when company may be popping over and the Pepperidge Farm Puff Pastry is perfect for a quick and delicious appetizer, dessert or stunning entree. Thanks for your comment. Thank you Caroline, I hope you try one of them. These are beautiful! I never knew you could be so creative with frozen puff pastry. Thanks for sharing! What a beautiful and yummy looking treat. 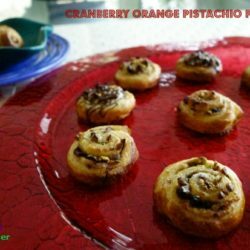 There’s not one thing I’d change when I make this, loving the pistachios in the pastry.